Authors: Mervyn Brown, John Mack, J. A. Rakotoarisoa, and Simon Peers. Additional Contributors: Robert Dewar, Fredo Betsimifira, C�saire Rabenoro, Gis�le Rabesahala, Mamy Rakotobe, and Barbara Turfan. This book was inspired by the burning down of the Rova (Queen's palace) in Antananarivo, Madagascar on 6 November 1995. 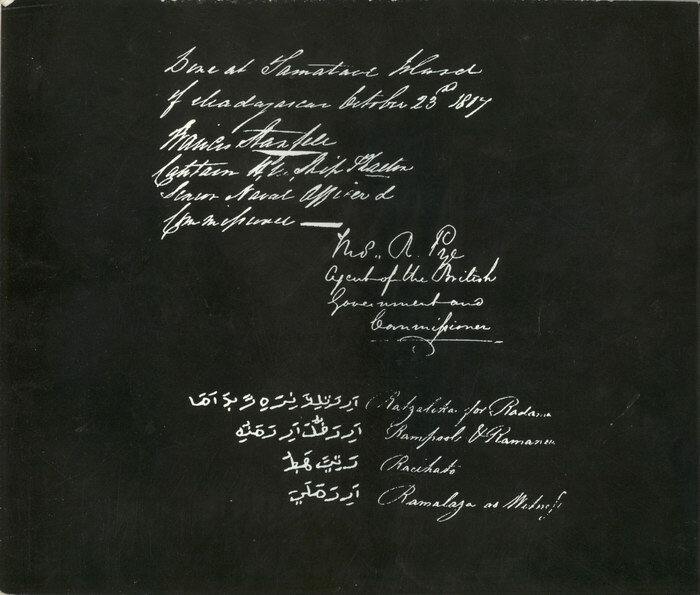 Proceeds from the sale of the book were put towards the palace's restoration. The work is a collaborative effort of several Malagasy experts, with the support of several companies including DeLaRue, Mabey, Land Rover, Pullma, and the Africa and Indian Ocean Command of the Foreign and Commonwealth Office. Miroborobo tokoa amin' izao vanim-potoana izao ny fifandraisan' ny firenena anglisy sy malagasy. Tsy tongatonga ho azy izany fa efa narafitry ny tantara hatramin' ny ela, Ilaina ve ny mampahatsiahyfa efa ho taonjato roa no nisian' ny fifanekena fiaraha-miasa teo amin' ny firenena roa tonta? Dian-t�na tokoa ny fiainana, kanefa itodihana ny lasa tsy embona, fa ahafaha-mijery ny ankehitriny sy hitsinjovana ny ho avy. Ankehitriny ary, dia fifaliana ho ahy ny manao teny fohy, ho fanamarihana ny fahavononan' ny Firenena Anglisy handray anjara, araka izay manandrify azy, amin' ny fanarenana ireo tahiry tao amin' ny Rovan' i Manjakamiadana, izay avotra tamin' ilay afobe nanapotika iny toerana manan-tantara iny, tamin' ny 6 Novambra 1995. Vavolombelon' izany ity bokikely ity. Nosy i Madagasikara. Tsy nitoka-monina izy, noho ny fifandraisany tamin' ny firenen-kafa, nefa koa tsy nanadino ny maha-izy azy; tsy navelany ho raraka an-tany mantsy ny soa sy ny mamy nentin' ny vahiny fa nogohiny ka zary vato manamafy orina ny fiaraha-monina. Lesona iray azo tsoahina avy tamin' nytantaran' ny fiaraha-miasan' ny Firenena Malagasy tamin' ny Anglisy izany. Mino aho fa ny taon-jato faha-21 efa manangasanga, dia hitondra aina vao eo amin' ny fifandraisan' i Madagasikara amin' ny firenen-kafa ka ny Fandriampahalemana, ny fifanajana, sy ny tombotsoa mifamaly no iorenan' izany. The relationship between the British and Malagasy nations is flourishing today. This has not been achieved by chance. History has been building it for years. Is it necessary to remind ourselves that cooperation treaties have existed between the two nations for almost two centuries? Life progresses like the chameleon. But looking back on the past does not mean nostalgia; it allows us to watch the present and to envisage the future. Today it is my pleasure to say a few words to mark the British nation's readiness to take part, as is appropriate, in the restoration of the collection from the Manjakamiadana Rova, saved from the disastrous fire which destroyed this historical monument, on November 6th, 1995. This catalogue is an evidence of this willingness. Madagascar is an island. It is not isolated thanks to its relations with other countries; however, it has not given away its identity; it did not waste the goods brought by the foreigners but thrived on them so that they have become a cement to the social fabric of its people. 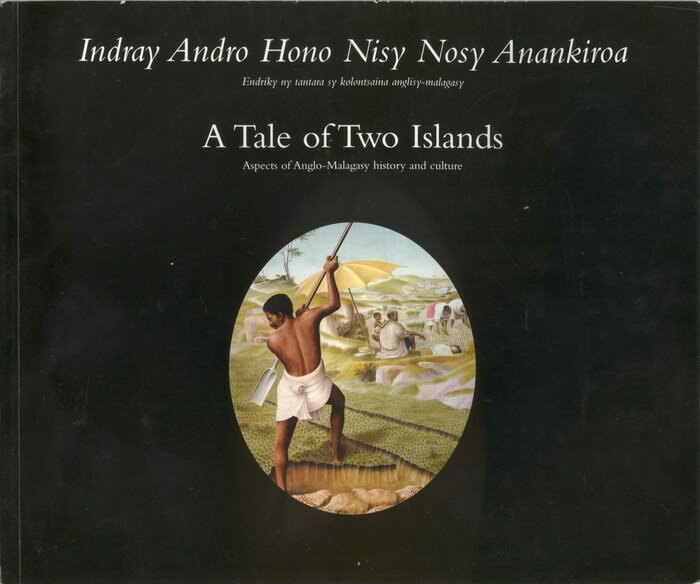 This is a lesson that can be drawn from the history of the cooperation between the Malagasy and British nations. I do believe that the imminent 21st century will bring about a new life in Madagascar's relationships with other countries, of which, peace, mutual respect and mutual benefit will be the foundation. Purchased by Mike Wilson in Antananarivo, Madagascar on 9 September 1999 for 75,000 Malagasy Francs. This item was kindly donated to the Madagascar Library collection by Mike Wilson.